Make spring learning fun for your students and easy for the teacher! Spring bunny themed ideas for a preschool or kindergarten classroom. Pocket chart pieces, teaching displays, activiy sheets, crafts, and more for hands-on learning fun! 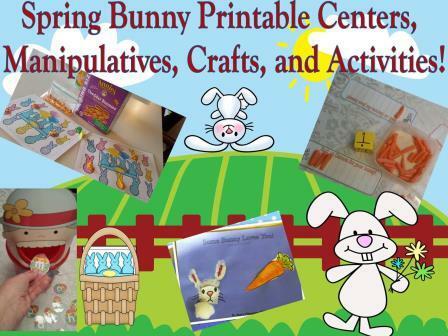 Hands-on Bunny Themed Games, Crafts, Teaching Materials, and Activities for Preschool and Kindergarten! Pages 7 to 11—Pieces and directions to make an interactive bunny counting chart to use at circle time. Counting back from 5. Pages 12 to 15—The pages needed to create a flip book for students to color that goes along with the poem on the previous pages. Pages 19 to 25— Shape and Color Pocket Chart Pieces… Find the real bunny and not one of his tricky friends. Page 26—Pattern Cut and paste sheet. Pages 27 to 29— Bunny carrot game. Counting up to 10. Pages 30 to 33—Patterns need to make a given bunny handprint craft. Pages 35 to 37—Printables to use with the Bunny Mallow Marshmallows. Pages 38 to 39—Directions and template to create a bunny water bottle. Pages 40 to 42—Various bunny activity sheets. Counting and tracing. Beginning sound. Pages 43 to 45—Bunny Beginning Sound Center. Student matches carrot letter to bunny picture. Pages 46 to 47—Bunny Tracer page. Pages 48 to 60—Peeps craft idea with templates. Pages 52 to 53—Peep Dice Game - Counting to 12. Counting two sets. Pages 54 to 60—Peeps card game to practice skill of your choice. Beginning sound cards provided. BONUS FILES to Match There Was an Old Lady Who Swallowed a Chick!! +Old Lady Dice Game—Includes printable dice. Students Take turns rolling the dice. Be the first to fill the old lady’s mouth with each item she swallowed and you win! +Printables to create you own old lady to feed. Includes eggs with all letters and baskets you can program with your own skill! +Old Lady Swallowed a Chick Pattern Practice Center: AB, ABC, AABB patterns practiced. Student places the picture next to the correct pattern. +2 Hands On Following Direction Activities. + 2 Activity sheets to match the story!